Providing jewelry repair needs to the Boulder community, too. 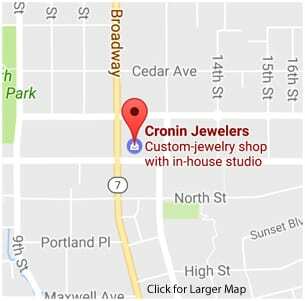 For more than 30 years, Cronin Jewelers has been the preferred custom jewelry store in Boulder. For jewelry repair needs and custom jewelry pieces, our team is conveniently located at Ideal Market Shopping Center in the heart of Boulder. To contact Cronin Jewelers call (303) 440-4222, fill out our contact form, or stop by our jewelry store in north Boulder in Ideal Market Shopping Center! Leave us a comment or question. We’ll reply as soon as we can. Apologies, we do not work on watches or silver jewelry. You may upload up to 3 files with a maximum size of 3 MB each. Starting on Dec 5th we will be open 7 days a week!